BROOKLYN, N.Y.– Brooklyn Borough President Marty Markowitz, NETS General Manager Billy King, and NETS Head Coach Avery Johnson will unveil Barclays Center and NETS Basketball mobile 'EXPERIENCE' on the plaza at Brooklyn Borough Hall TOMORROW, Tuesday, Nov. 15, at 2 p.m. 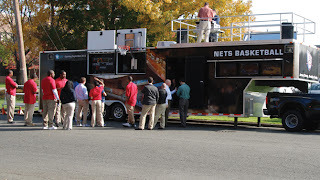 Fans are invited to visit The EXPERIENCE, where they can participate in basketball shooting contests, receive free t-shirts, and be entertained by the Nets Dancers and team mascot Sly. 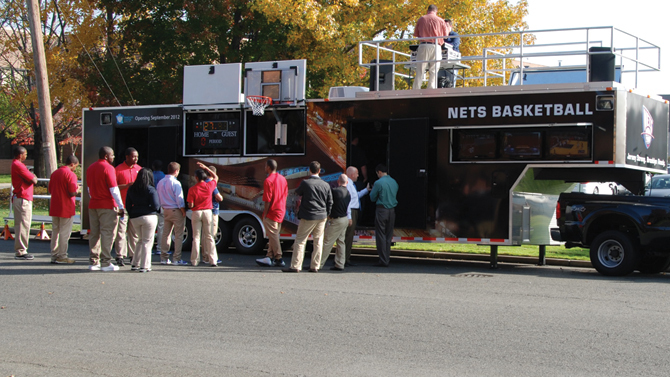 Dubbed The EXPERIENCE, the 40-foot trailer provides an unprecedented Barclays Center/NETS interactive happening for fans at events throughout Brooklyn and the Metropolitan area. Themed with Barclays Center and NETS branding inside and out, The EXPERIENCE features a built-in 10-foot regulation basketball hoop with an electronic scoreboard, and the newest PlayStation 3 and Nintendo Wii games are available for play on exterior flat-screen televisions. Fans will be able to step inside and shop the on-board team store for the latest NETS and Barclays Center merchandise, as well as take a virtual tour of Barclays Center and purchase NETS All Access season tickets. Then fans can step to the social media section, in which they can follow the NETS and Barclays Center on Facebook and Twitter. At select events, The EXPERIENCE will offer 'Brooklyn Taste' culinary options, while up-and- coming artists will perform on the roof-top stage. "As we prepare for the team's move to Brooklyn next year, The EXPERIENCE immediately enables us to bring exciting features of Barclays Center and the NETS brand to fans in dramatic style," said Barclays Center and NETS CEO Brett Yormark. "The EXPERIENCE is a unique one-stop opportunity for people to have a great time and to learn more about Barclays Center and their new hometown team." WHO: Brooklyn Borough President Marty Markowitz, NETS General Manager Billy King, and NETS Head Coach Avery Johnson. WHAT: Unveiling of The EXPERIENCE, Barclays Center/NETS mobile unit. WHEN: TOMORROW, Tuesday, November 15 at 2 p.m.